I would’ve been locked up for a murder Young thug implies on Nipsey Hussle's murder. HomeentertainmentI would’ve been locked up for a murder Young thug implies on Nipsey Hussle's murder. 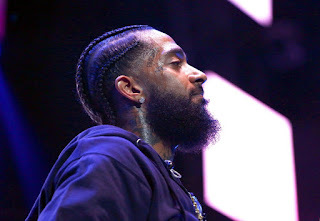 Since Nipsey Hussle was shot dead outside of this store at Los Angeles, a lot of celebrities and individuals have been pouring out their mind on the killing and young thug has been one of those that has made there mind known to all. The 33-year-old was in the peak of his career, dropping his Grammy-nominated album a year ago and becoming one of the West Coast's legends through his hard work and dedication. Nip's peers have been reflecting on his legacy all day and Young Thug made sure to speak out about the rapper, claiming that he would have been aiming his gun at the triggerman had he been at the store. He wrote on his Instagram page; "Glad I didn’t make it to the store, would’ve been locked up for a murder,"
The 33-year-old was in the peak of his career, dropping his Grammy-nominated album a year ago and becoming one of the West Coast's legends through his hard work and dedication.